Blackberry Bold 9650 Unlock Codes | Free Your Blackberry Bold 9650 Mobile Phone Today. STEP 2: Enter Your Blackberry Bold 9650 Details. 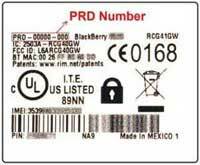 Your Blackberry Bold 9650 IMEI number and PRD can be located on the label under the phone battery (see image below). Please enter the IMEI and PRD (Product Code) information to generate the correct unlock code for your Blackberry Bold 9650. Make sure you read and understand the Blackberry Bold 9650 Unlock Code Checklist before you purchase a Blackberry unlock code for your Blackberry Bold 9650! Thanks. It worked prefectly the first time. Will everyone about it. Exactly 9 minutes, wow!Site looks a bit dull but do not get the wrong impression. After scouting for a week I finally found a provider that could unlock the Alcatel OT-991, and at a third of the price (GBP 3.99) normally charged. Thank you!